I’ve been ambushed by some germs that didn’t take sudafed for an answer. Just as the holidays were coming to an end and work was starting to pick up again. It’s irritating, but hardly fatal, so I fortify myself with coffee and red wine, dose myself with sudafed and try to write. 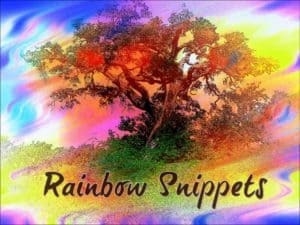 And tonight’s rainbow snippet is, again, from Swings & Roundabouts. And no, I still haven’t decided how best to style the title, with a proper “and” or an ampersand – any suggestions would be helpful. Does one work better than the other? Back to the snippet though. We’ve had a lot of Jack in the last weeks, and that’s because Gareth has been jetsetting all over Europe bargaining for info on one of Aidan’s cases. Now he’s home, having completed his job and he feels a little out of sorts, seeing that the world didn’t end while he wasn’t home. Only Gareth, really. And yes, there’s some creative punctuation involved in this snippet. Sorry. Gareth loved looking after people. Now that the people he looked after were truly his, it gave him an even greater thrill. But there were days like today, when he woke up to find the house spotless and groceries on the doorstep, when bills had been paid and a leaking kitchen tap no longer irritated him as it had before Aidan had turned his life into a circus. Days when the boys’ homework formed an orderly stack on one corner of the kitchen table and a list of chores with neat tick marks beside each item had appeared on the fridge, and days when he didn’t just wonder whether he was good enough for the people that mattered most to him, but actually started to wonder whether he was needed at all. And then he was grateful that time to ruminate was limited. “Did the inky pasta come? Is it really black?” Daniel queried the moment he climbed into the car. Awww. I think I love Gareth. He just needs to be needed. I adore this man. It just takes me a long time to figure him out. He’s fierce, and occasionally tricky to pin down. But I think I’ve got him sussed. Lovely snippet of happy domestic life. Nice snippet, and now I’m tempted to try squid ink pasta! The look might give you pause, but do what Gareth does and serve it with baby broad beans and crispy bacon or flash-fried shrimps. Oh, and lots of parsley.